I'm no stranger to therapy. If anyone knows what it's like to sit in a room, once painted 'positive' yellow (since bleached by the sun) with chairs as comfy and welcoming as the NHS can afford, it's me. I know to some the idea of talking to a stranger about their deepest, darkest thoughts seems terrifying and awkward and uncomfortable all at once. But having started my journey with therapy at the age of 10, to me it's no more awkward than striking up conversation with someone at the dinner table. When I was younger I was taught that it was bad to bottle feelings up, so I spoke freely. Because being a teenager is often when people retreat within themselves and hide away, my openness was encouraged. But as I've gotten older, I've become more conscious of judgement. As much as the attitude towards mental health is shifting, I think that being a one in 'one in four people suffer with mental health difficulties' is so weighted now; I carry the label as a responsibility. I'm more measured with how much I reveal, wary that I am only one of the hundreds of thousands of voices behind the statistic. This means that day to day, I don't talk about how I'm feeling or what's bothering me. I just follow my routine and exist. So having time, once a week, to talk to someone about something other than work or TV or how much I ache from the gym (yes, my life is a constant thrill) is kind of great. I have thoughts and feelings and realisations that swirl around in my mind and it's is my chance to voice them aloud with absolutely no judgement. My therapist's face remains unmoved, but not unfeeling, as the words spill out of my mouth. I'm so often worried that I'll scare someone away with something I say, and it's liberating that for 50 minutes that can't be the case. By simply existing, I don't notice things building up. It's like when you go for a massage and the (massage) therapist starts to examine you. They'll start gently kneading, and begin to work on your knots. Which hurts. It can hurt to the extent that your knee-jerk reaction is to move away, to resist the pain. Sometimes it doesn't feel like the knots are easing, and when they move away to work on another knot, it's still sore. You wonder if anything was 'fixed', if anything has been accomplished. But then sometimes a knot will click after giving it a little attention. Sometimes a knot that doesn't feel like it's easing suddenly does. The best times are when you feel like the knot is impossible to work through, and it hurts so, so much, but after a few sessions, it becomes looser. Less painful. You feel a bit lighter. You don't know before the knots are worked on that there's anything to be gained. You kind of know you need a massage, and that you're carrying around extra tension. But until it's faced, you don't know the extent, or how much you needed it. So this isn't to say that everyone is carrying around something that needs to be examined - not everyone needs therapy. But sometimes, you do. And some people will need it as much as you need that weekly catch up with your mum or best friend, or a cuddle with something fluffy. And that's okay. 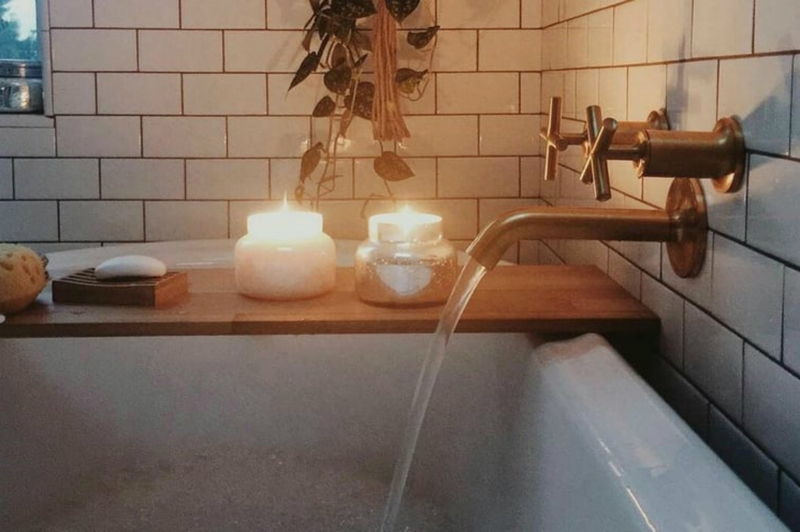 Rather than feeling ashamed, or feeling like because I need it I've somehow 'failed' to keep my mind healthy by myself, I'm learning to accept it as a further method of self-care - like a bath. Wouldn't it be great if people considered therapy as normal as running yourself a long, hot bath? I hope one day we can.